Dumbarton Oaks’ Image Collections and Fieldwork Archives (ICFA) announces the public launch of its online inventory, AtoM@DO (atom.doaks.org). A searchable database of Dumbarton Oaks’ archival collections, AtoM@DO brings together the holdings of ICFA and a selection of the Dumbarton Oaks Archives (DOA) into a single virtual space, enabling discovery of related materials across the institution. Instead of searching collections one-by-one by means of individual PDF finding aids or collection guides, AtoM@DO enables users to search across all holdings — either by keyword or through browsing the various menu options: Names, Places, Subjects. Search results are presented within the context of their collection, making it easier for users to learn more about the materials they have found and discover other relevant resources. AtoM@DO is a local implementation of the open-source archival collection management system, ICA-AtoM, which is based on standards developed and promulgated by the International Council on Archives (ICA) with initial funding from UNESCO. You can find more information about the system and the standards ICFA employed, under the Quick links menu in the upper right-hand corner of AtoM@DO. Find a link to the system along with a list of common FAQs on the AtoM@DO Help page on the ICFA website. This same page is accessible from anywhere within the system by clicking the Help link under the Quick links menu in the upper right-hand corner of AtoM@DO. Users can also contact the system administrator directly, ICFA Metadata and Cataloging Specialist , Anne-Marie Viola (violaa@doaks.org). Over the course of the year, ICFA plans to enhance description of its collections within AtoM@DO, including expanding on collection-level records and adding digital objects for portions of ICFA’s photograph collections, which comprise more than half a million images. In doing so, ICFA will virtually reunite the fieldwork photography used to seed the reference collection with the archival collections from which they originated. The database is a work-in-progress and new functionality and content will be added based on a prioritized list developed by the department. 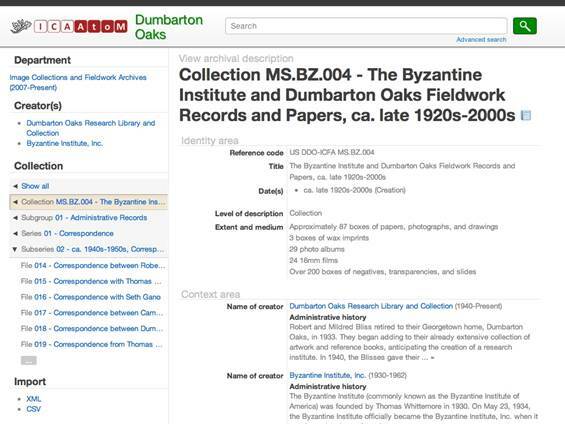 Note: Traditional long-form finding aids for archival collections continue to be maintained on their respective pages: ICFA’s Byzantine Archival Collections and DOA’s Historical Papers.